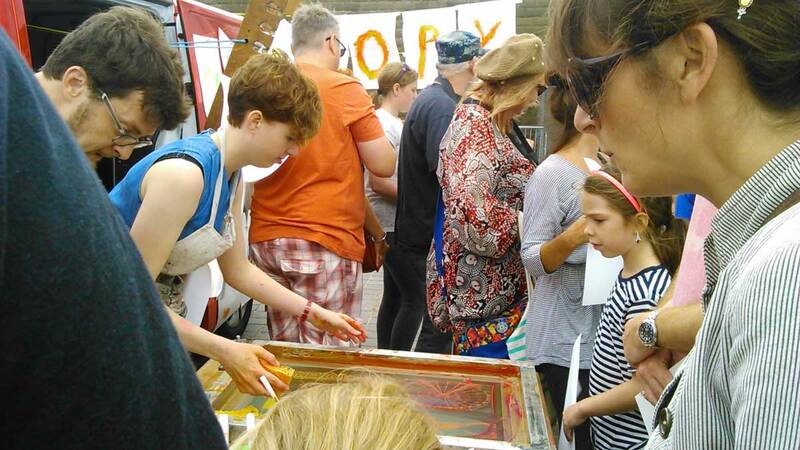 REVIEW: ART CAR BOOT FAIR, MARGATE, AUGUST 30th 2015. A day at the The Seaside (capital T, capital S). It’s still there, in our memories, or our imagined memories. Going on a jet plane to a Beach is not The Seaside. The Seaside comes with challenges and history and a whole bunch of details and experiences that you don’t get anywhere else. It’s a gamble, for a start: what if it rains? Luck is everything. At The Seaside, luck brings you sunny days, pretty shells, a win at bingo. Luck might also cause a whole set of strange circumstances to coincide, maybe a century of wear and tear that gets you sea glass. A bit more of a century of wear and tear gives you Margate, a pebble of sea glass left behind by a tide of holidaymakers who got on jet planes. The thing is, lots of interesting things can be found in the tide line. 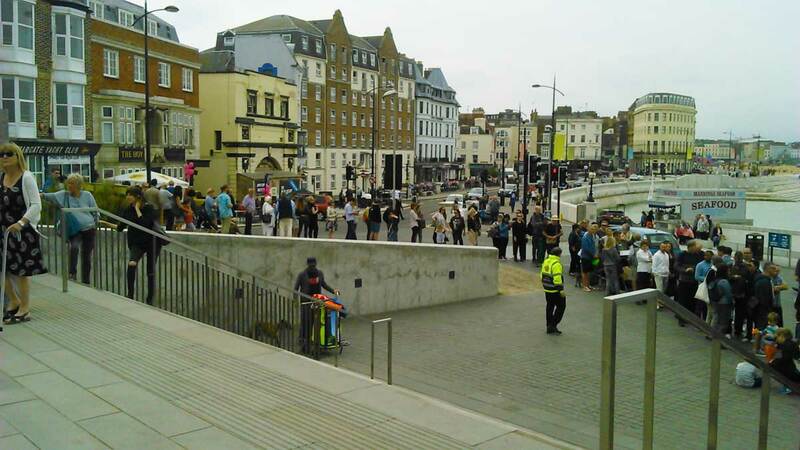 Margate had the light and space and lack of attention to allow some artists to do their thing without hindrance. Off they went on the tide, and came back on the next one, bringing a gallery and a desire to restore, energise, cherish the place. Why bother? Because English seaside towns are unique, and they’re not perfect or easy places, and you get out of them what you bring to them. You don’t go to The Seaside to spend money (though goodness knows the seaside towns need it), but paddle and make sandcastles and poke around rock pools and get joy out of things that can’t easily be explained. Which brings us to the Margate Art Car Boot Fair. Anybody who thinks the Art Car Boot Fair, particularly this Margate edition, is all about money, is a cynical knotted hanky-wearing old grump who needs to get in the sea, preferably at high tide and during a gale. Yes, there’s a queue for the Big Names at these things, and yes, people are there because bargains, because ebay, because ooh look there’s a famous person etc etc. And then the queues calm down and the families and dogs and curious and the arty eccentrics mingle and stare and laugh and a sweet and funny and unique day out is had by all. Can we please, please, have a little more focus, by the redoubtable journalists of our land, upon the less famous purveyors of art who make up the stalls of the ACBF each year, rain or shine? And the peripheral madness such as the Alternative Ministry Of Transport with their treadmill-driven monstrosities, or the galleries in garden sheds, the live screen printing, the performance art, the pin the tail on the artwork and the great little paintings that you have to dig through crates and lift into the light to appreciate… the gutsy ceramics, the bookshop in a caravan, the unknown local artists that the ACBF always try to include in their non-London outings. Going back to the Big Names: Tracey Emin and Peter Blake had the biggest queues, and spent the first few hours on their stalls, signing away and engaging with people. I noticed Tracey taking a lot of time to chat, and people clutching the ceramics they bought off her as if – heaven forbid – they really, really wanted them, just to treat themselves. No ebay involved. 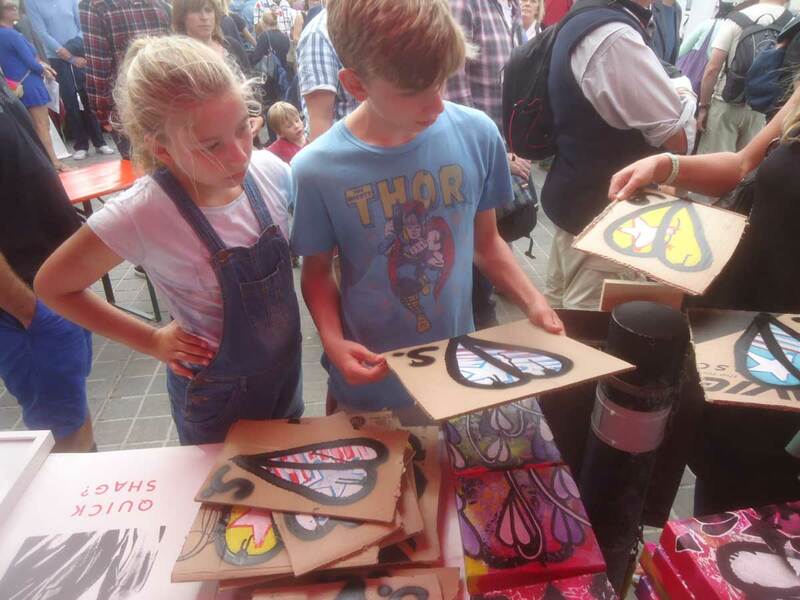 Let’s not fail to notice what the kids are doing – they’re nagging their parents to buy paintings they like, or having a go at printing, or watching the little girl who has her own stall and is selling her own paintings. And the things that aren’t free to do or watch are ridiculously cheap. Oh, I can hear that cynical voice right there as I type this, that drizzle of superiority that crushes, that doesn’t get it. Well, in the sea with you. It’s not perfect, but the quality is there, the spirit is there, and it’s up to you whether you engage and enjoy and appreciate it. We love it. It’s your loss, mate. Click on an image to enlarge or run the seaside slideshow and the photos direct from the Cultivate boot….